Taking pride of place in Galle’s historic 17th century UNESCO-certified colonial fort on Sri Lanka’s south-western coast, No. 39 Galle Fort, our luxuriously converted heritage home, beautifully blends the old with the new. Striking Dutch-era furnishings, graceful archways, pillared verandas and soaring ceilings paint a nostalgic picture of the past whilst deeply cushioned loungers, lavishly adorned beds and homely, modern facilities bring No. 39 firmly into the 21st century. Despite their inner-fort location, our three atmospheric bedrooms are blessed with unique views. On the upper floor, the master room basks in vistas of the fort’s red-tiled rooftops; the second bedroom opens onto the villa’s courtyard garden, and the third engages with the fort by glimpsing at the goings-on along Lighthouse Street. Affording further relaxation are an expansive living and dining room, a cosy mezzanine TV snug, a furnished garden veranda and an alfresco dining table for six – perfect for lazy breakfasts and cocktails at dusk. Our friendly staff, including a talented cook, take care of all the necessities at the house to ensure your holiday is relaxing and hassle-free. 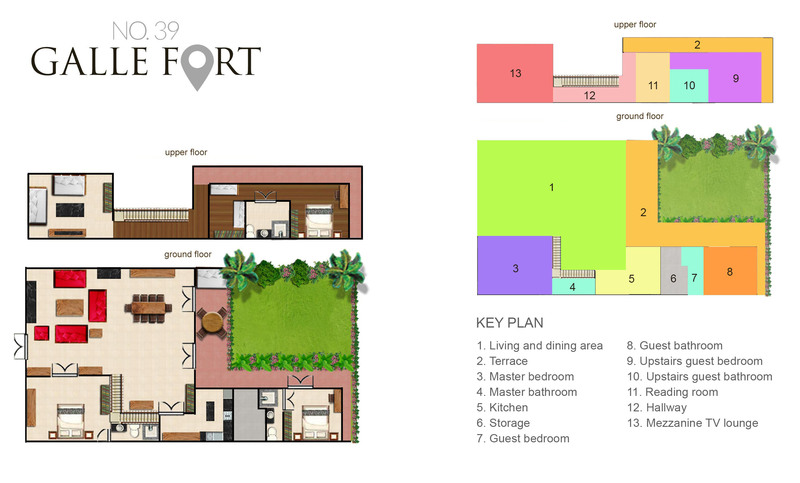 If you’re a family or group of friends in search of a central fort home-from-home, you’ll love No. 39, where there’s ample space for socialising or for curling up quietly with a book. Our well-equipped kitchen allows you to self-cater if you feel so inclined, or to prepare meals for children. Galle Fort’s fabulous attractions are mere footsteps away. Take time to wander the narrow streets to appreciate the hybrid nature of the fort’s striking European architecture, make for the ramparts at sunset, perhaps join in a game of cricket or take a quick dip in the sea to help work up an appetite before dining in one of the fort’s restaurants. Finally, return to No. 39, where every home comfort awaits.